62.07% of people buy Attack On Titan 22 and Attack On Titan 21 ~ Paperback / softback ~ Hajime Isayama. The blockbuster manga edges closer to its thrilling conclusions. The mysteries of the Titans are being revealed...who will escape death at the hands of giants and human beings?Story Locale- The post-apocalyptic futureSeries Overview- Humanity has been devastated by the bizarre, giant humanoids known as the Titans. Little is known about where they came from or why they are bent on consuming humanity. For the past century, what?s left of mankind has hidden in a giant, three-walled city. 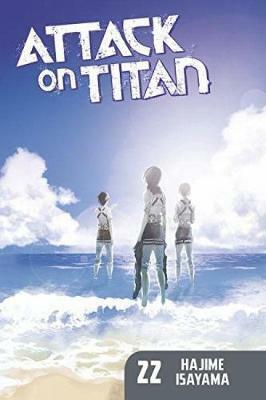 Now, a young boy consumed with rage displays a strange ability- The power to transform into a Titan! Is this the lucky break humanity needs to survive? With his debut series, "Attack on Titan," Hajime Isayama has enjoyed a meteoric rise from unknown to one of Japan?s top comics artists.